The Nivea Whitening Lotion repairs whitening cells and provide protection against UV rays. It is formulated with super fruit extracts of camu camu and acerola cherry that keeps the skin refreshed and maintains the complexion. Well, Snapdeal is offering Nivea Whitening Lotion SPF 15- 400 ml worth Rs 360 at Rs 252 only. Additionally, you will get free 2 Nivea Soap 75g with free delivery. Isn’t awesome ? So what are you waiting for, go now and avail it !! Amazon is selling the same Nivea lotion (without freebies) at Rs 360 + delivery charges !! 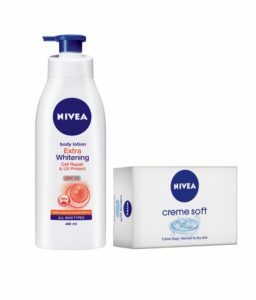 How to get this Nivea Lotion + Free Soaps ?